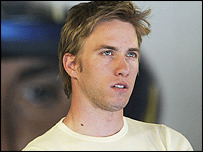 Nick Heidfeld will be given the chance to test again for Williams as he tries to secure a race drive with the team. The German had a better test at Jerez on Thursday after struggling in wet and windy conditions the previous day. "He will run again. He will get the time he was promised next week as well," said a Williams spokesman. Heidfeld is trying to prove he has what it takes to partner Mark Webber at Williams next season, although Antonio Pizzonia is favourite to get the drive. Brazilian Pizzonia was slower than Heidfeld on Thursday as the German finished less than half a second behind pacesetter Jacques Villeneuve. Villeneuve performed well in his Sauber, although testing times are notoriously difficult to interpret with teams trying different set-ups to develop their 2005 cars. Vitantonio Liuzzi also showed good speed as he stepped up his bid to earn a race seat with Red Bull next season. The Italian spun early in the day on a wet track, but hit back to claim third, outpacing fellow Red Bull driver Christian Klien.